Sewer line tree roots invasion! 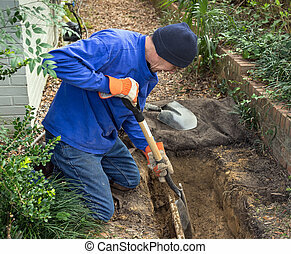 Man crouching in trench with shovel showing an old terracotta sewer line broken open to reveal a solid tube of invasive tree roots. 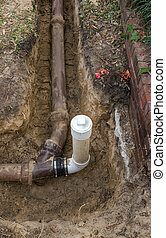 Sewer Line Tree Roots Invasion! 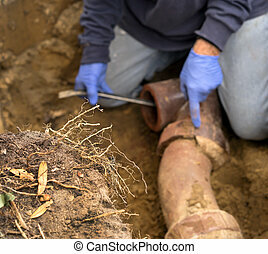 Man crouching in trench with shovel showing an old terracotta sewer line broken open to reveal a solid tube of invasive tree roots. 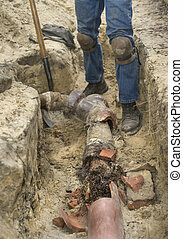 Man with shovel in trench showing old broken terracotta ceramic sewer line completely filled with invasive tree roots. 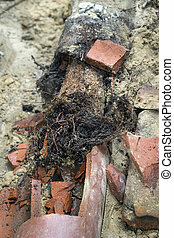 Closeup of broken old terracotta ceramic sewer pipe line showing pipe completely filled with tree roots. 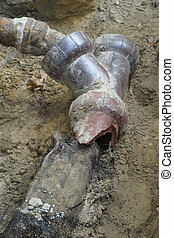 Closeup of sharp focused tree roots with a blurred background of man digging out clogged old sewer line pipes. 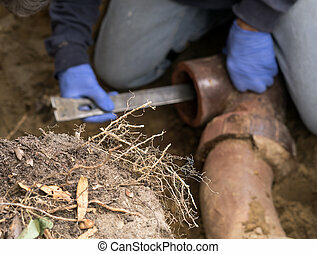 Closeup of worker's hand pointing to area of sewer line that has been invaded by tree roots. 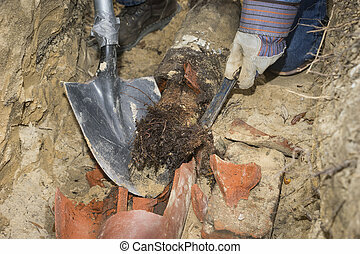 He is in the process of digging out tree roots and replacing the sold clay ceramic sewer line with a cleanout. 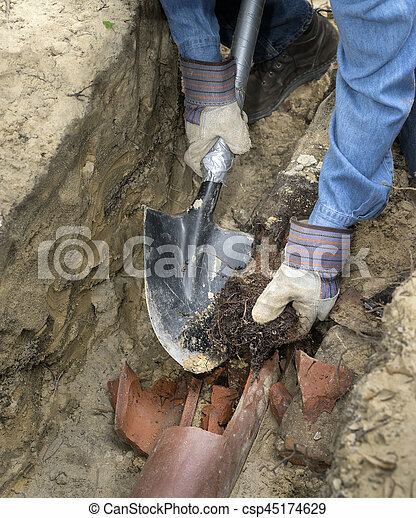 Closeup shot of man digging tree roots out of an old ceramic sewer pipe in a hole in the ground, pointing at the area where tree roots have invaded the joint in the pipe. 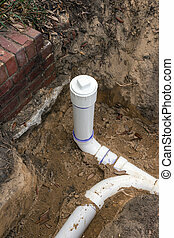 New PVC pipe sewer line and clean out installed in trench. 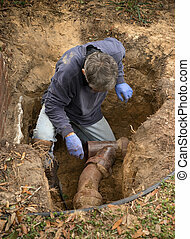 Man in a hole in the earth examining old clay sewer pipes that are infested with tree roots. 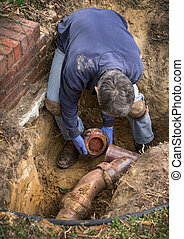 Man digging trench to replace old sewer pipes and lawn sprinkler system line. 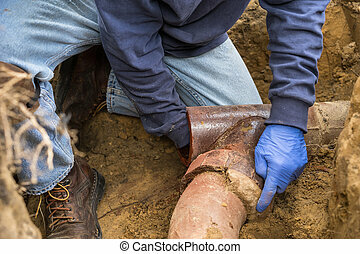 Man removing sections of old clogged clay ceramic sewer pipe in trench in the ground.